Ever since there has been currency, there has been theft, fraud and more! Even in Ancient Egyptian times when beer counted as currency, there were people passing counterfeit beers and stealing jugs of beer from others. Unfortunately, for every 100 good apples, there’s 1 or 2 bad apples, that’s just the way it is. Step #1: Keep An Eye On Your Credit Report – Your credit report is a surefire way to tell if someone has your information or not. The truth is, most identity protection services keep an eye on your credit report and throw up red flags when something just doesn’t look right. You can do that entirely on your own. There are tons of free credit monitoring services out there that you can utilize for tasks like this. Just make sure to use the tools available to you and check your report once a month to make sure that no fishy loans have popped up! If you find one, start by reporting it to the credit reporting agencies and research identity theft recovery. Step #2: Safe Web Surfing – The internet has done amazing things for humanity! It has lead to a level of learning light years beyond what we could have imagined 100 years ago. It’s provided simple ways to save money, work from home opportunities and more. However, there are those pesky internet scams and con-artists! The truth is, not everything online is safe and, because of the nature of the internet, it’s impossible to ensure safety while searching. But, there are tools we can use to be 99.99% that our personal information isn’t stolen. It’s all in the structure of URLs also known as web addresses. If you pay close attention to the URL you will notice that they all either start with http: or https:. These simple prefix’s tell us if the page within a website is secure. So, if you are purchasing a product, applying for a credit card or doing anything else that would require personal information it’s important to make sure that the URL for the site you’re entering information into starts with https:, meaning it has a security certificate. Most browsers have tools for this as well. For instance, with IE, there is a small padlock graphic in the bottom right hand corner of the screen. If the padlock is open, the website is not secure, if it’s closed, it’s secure. Google Chrome uses the same padlock functionality however, their padlock is right in the address bar where you enter the URL. Step #3: Keep An Eye On Your Financial Accounts – When many people get their checking account or credit card statements, they discard them, not thinking to read them. By reading through your financial statements, you can easily catch and report fraud. By catching fraudulent activity, you could save yourself tens of thousands of dollars in cases of identity theft. Always remember, for every beautiful flower, there is dark, ugly dirt that’s full of worms helping it to grow. We have built the most civil civilization in humanity. Is it perfect…far from it but, at least we aren’t chasing members of the community down with torches and weapons at the slightest infraction of neighborhood rules anymore. However, no matter how much we grow as a civilization, there is always going to be the chance of theft, fraud and more. The key is protecting yourself. I hope you’ve enjoyed this week’s Monday Money and I look forward to your comments! There are also services such as LifeLock that can help protect against identity theft and fraud. I’ve never used the service but have heard it’s great. You are absolutely correct. LifeLock is great but, the truth is, you can also monitor your credit on your own. Thanks for your comment! I have a co-worker that had LifeLock and he felt very safe with it. But, he still got his identity stolen with it! The best bet is to routinely monitor your credit and accounts. Nothing can replace that human touch. Like Brian I have also heard of some services such as Lifelock. But simple things like locking your phone and computer are big ones. I don’t know how many times I see people leave there computers and phone unlock in public places. And please stop with the using of the same password for everything. Hey Thomas, thanks for your comment. I have to agree…keeping everything locked is pretty important! Passwords, I’m with you there too! Yes, keeping your phone and computer locked wherever you are is a must. These are nice, quick and easy tips. I think many people don’t realize how many potential security mistakes they make while surfing the web. I know I rarely give out my social security or credit card numbers unless I know it’s a secure website. It may not fully protect me, but it sure doesn’t hurt. Hey Jake, thanks for your comment. Internet purchases and forms can be very dangerous if they are not secure. I agree, people should be more aware of this. Most of those “credit monitoring” sites aren’t worth the money. If the creditors don’t report their info immediately how can any of those service providers claim to protect you in “real-time”? The fact of the matter is that is always a delay and there is no real way to be 100% protected. If you really want to protect yourself you can follow the tips in my guide. It’s full of things you can do for yourself, and without very much out of pocket cost to you. Plus, almost everything is doable by almost anyone regardless of age or computer savvy. Thanks for your comment. I agree that no one is fully protected however, some services put a block on your credit so you get a call before your credit ever runs…that’s a good way to go for protection. Great tips Joshua, I also use annualcreditreport.com to look at my credit reports for free as well. AnnualCreditReport.com is great. I advise it to just about anyone I talk to about credit scores! Hey CBB, thanks for your comment. I have to agree that there is no way to be too safe! I had my credit card info stolen and I found out because there were some unusual internet purchases that turned up on my monthly statement. I didn’t know about watching for http or https on the URL. I’m glad you mentioned that. Sorry for that awful identity theft experience. Its absolutely crucial to keep tabs on your statements as this allows you to notice discrepancies as soon as they happen…and yes, if you are to provide your credit card numebr online, ensure you are on a secure https connection. I check my credit report once a year to make sure there isn’t anything out of the ordinary on it. It’s a quick and simple way to save yourself a lot of stress if something were to happen. Definitely a simple way to go but, I would suggest at least quarterly checks. Thanks for your comment! Great tips Josh! One thing to add to number two when surfing the web is to make sure your connection is secure! Never ever pay bills or login to confidential sites when using an unsecured wi-fi. Another thing I try to do is not save any of my credit card information on any sites when I buy things. If anything happens…then the crooks can’t get my cc info that way. Plus of course it helps me avoid temptation by making it harder to buy stuff. Then again…I kinda have my cc number memorized. Point on Christine. I think it cannot be emphasized enough that if you are going to be shopping online then ensure that you are connecting to that site securely. Its better at the end of the day to be safer than sorry. First, great tips. Even more importantly, is that you are creating awareness – people that are aware of what is happening will go a long way towards helping to reduce the crime of identity theft. – It is impossible to *prevent* identity theft. However, you can make it more difficult and reduce your chance of being hit. – Credit monitoring is important, but as others have pointed out, it is not the only indicator of a problem. In fact, usually less than 20% of identity theft is something that would show up on a credit report. – You can have the three big credit reporting agencies send you their credit report one time a year, for free. That means that you can run a report every 4 months (not quarterly) without spending money. – Credit blocks can help some. However, since this article is about free methods of protection, they need to be aware that to place and remove those blocks it will cost them money. The exception is if they have a verifiable identity theft crime committed against them (complete with police report), then you get some of the block stuff, for free – but not forever. 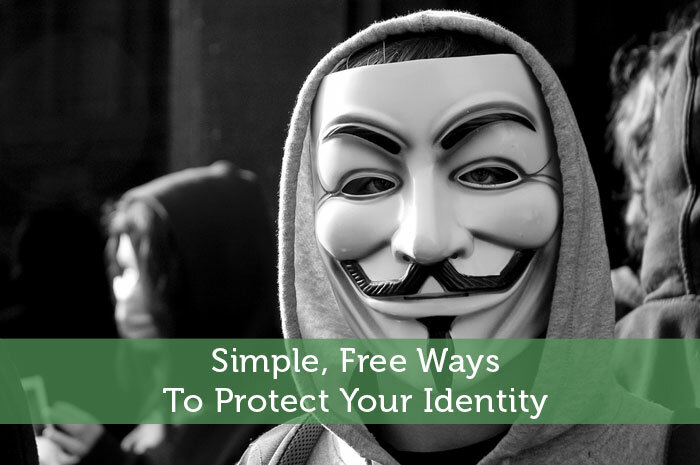 – The Federal Trade Commission has a free booklet (in physical and PDF form) that has a lot of information on identity theft. – There is a lot more to the issue, and awareness is a great first step. Do more homework on the issue. Thanks Scott for adding those key points to the discussion and for that valuable FTC resource. And I concur with you, few things will stop a determine “hacker” from disappearing with your identity but steps can be taken to make it un-worthwhile for them in terms of the time spent and their gains. Additionally, its crucial to keep an eye for other areas that may be pointers to an identity theft eg, social media accounts etc. What a great write up! The information you have listed here is valuable! I’m not familiar with Credit Sesame but from what you have described, it sounds worth checking. Also, your points about safe web surfing are spot on. I also will surf the internet sometimes anonymously which can help to some degree. But thanks for your post, I enjoyed reading it.